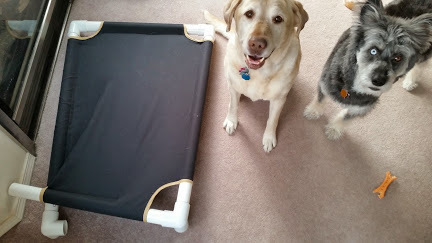 I read online that dogs with hip problems and arthritis benefit from a little dog cot called a Kuranda bed. If you look at the picture of the product, it’s basically a piece of cloth and some PVC. If you’re like me, you look at that and think to yourself, I could totally make that myself and probably for cheaper, too. My lab is getting up in years, and her hips take a beating from her unbridled joy in running. After a visit to the dog park last weekend, I decided it was time to make her a super comfy bed. And now, I’m here because I’d like to admit my failure to you all! I failed and did so spectacularly. My first mistake was not following any directions… not because they can’t be found or because they are too difficult to understand. Nope… I didn’t follow directions because this has got to be so simple that no one would need directions. So… I spent $155. I just want to point out that I could buy nearly two Kuranda beds for this amount. Months later, I finally get around to working on my project. I had Monday off for Seward’s Day– Hurray for state holidays! So, I roughly assemble the frame, take some quick measurements, do some math in my head, and cut my fabric. Incorrectly. I only added enough length for two of the frame pockets and not four. So, I re-cut my fabric, bigger this time. 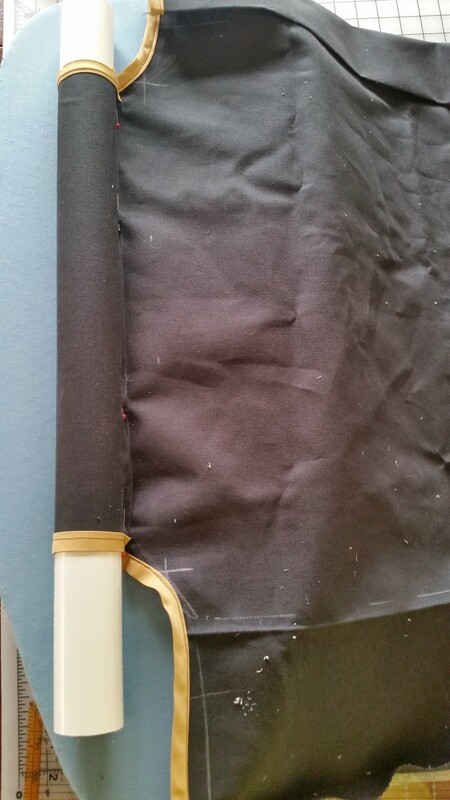 Then, I cut out space for the corners and sewed those up with bias tape to look spiffy. This was the easiest part of the project, and I thought it was going to be so hard! You’ll notice a lot of wrinkles in this piece of fabric. I was tired of ironing, so I just decided that the tension of the finished project would sort out any wrinkles (which it did!). Then, I sewed my pockets for the frame. One was super, super tight, but I just did manage to get the length of PVC pipe in. At this point, I’m feeling wildly successful, and the fact that I’m nearly 6 hours in seems a small consideration. 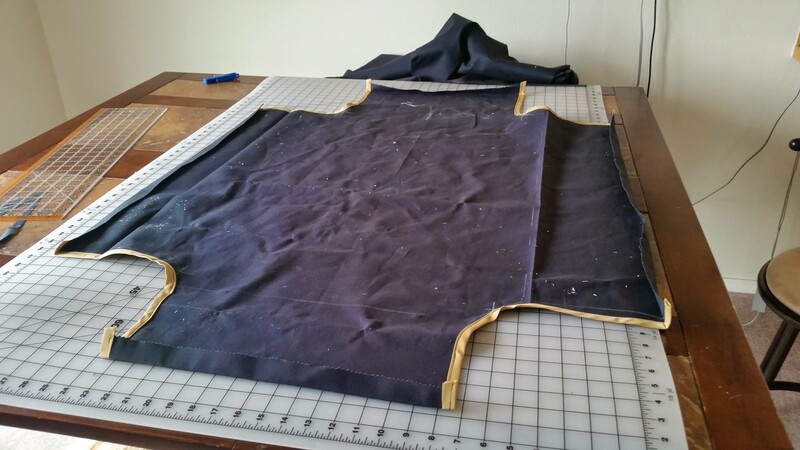 Then, I started adding the corners to the four pieces tucked into the appropriate pockets. Corner 1 was easy. Super easy. This was totally worth the 6 hours it took me to do this. Corner 2 was a snug fit, but nothing to be concerned over. Corner 3 was a little difficult, but it was easily hammered into submission. Corner 4 was hard. Really hard. I consulted some directions online. The fit promised to be tight, but that would be good for the dog bed. So, I found some measure of brute strength within, and applied it to the fourth corner. And now, I have a ripped dog bed with a fourth corner that will not be worked into the appropriate spot… and two very smug pups. And you’ll notice– no wrinkles! So I’ve learned some lessons from this project. When a company charges $85 for a product online, and lots of professional places rave about that product… don’t assume you can just make it yourself for cheaper. Also, follow directions… even if there is concern that the finished project won’t meet your specifications. Do it like you’re supposed to the first time, and then you can tweak it from there if necessary. And finally, I should have just purchased a Kuranda bed. I could have spent this time on something simpler… like quilting. 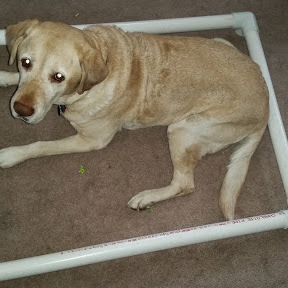 This entry was posted in All, Sewing and tagged DIY dog cot, dog cot, homemade dog bed, kuranda bed, pvc dog bed, PVC dog cot, sewing. Bookmark the permalink.